(In French, on TV, June 2017) Sometimes, we’ve grown so accustomed to the parody that we’ve forgotten what the original looked like. If your idea of 80s cop action drama dates from Last Action Hero, then go back to Tango & Cash for a look at what the pure ridiculous source material could look like. To be fair, it’s not as if Tango & Cash takes itself seriously—there’s already a bit of self-parody built in the film, and the results, as seen from nearly thirty years later, are often nothing short of ridiculous. There’s Sylvester Stallone, fooling no one by wearing glasses that don’t seem to serve any purpose. But then there’s Kurt Russell, chomping scenery as another loose-gun policeman. It takes place in Los Angeles, of course. It covers quite a bit of male bonding between two headstrong partners. It’s bonkers in the most asinine action-movie ways, such as sending two cops in jail, and them allowing them to break out. To be fair, the prison sequence is the film’s highlight—the subsequent investigation back in the world pales in comparison. 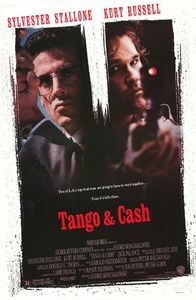 Tango & Cash is a bit of a mess, which can be explained if you read about its troubled production history. Unfortunately, it’s not a particularly entertaining one, except in bits and pieces. At least Stallone and Russell are both quite good in their characters, with a showy supporting role for Jack Palance and pre-stardom Teri Hatcher. Tango & Cash is a must-see for whoever is interested in the history of buddy-cop movies, but let’s not pretend that it’s anything essential for everyone else.